Fascinated by the idea of keeping chickens? Hesitant at the thought of having to regularly feed the chickens and get up early to let them out into the yard? Looking to optimise your existing chicken pen? If you answered yes to any of the previous questions, you are in the right place! Blogger Roger Reed has create an excellent fully automated chicken pen. The pen includes features such as fully automated cooling, lighting, food, water, an automated door and even an infrared camera. Not only have these improvements saved Roger a lot of time, they have also increased the number of eggs his chickens “Penny and Henny” have been laying! 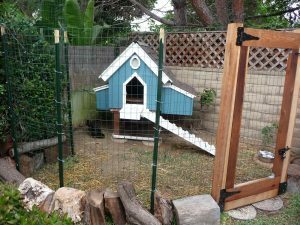 To get started building your own Arduino chicken coop, check out the comprehensive blog Roger has used to document the project. Automating your chicken coop could be a great place to start building up your skills before you start modifying your house. Subscribe to SuperHouse Automation on YouTube to learn more about creating your own home automation system! Have chickens that could benefit from this project? Inspired by this project? The team at SuperHouse Automation would love to know! Let us know in the comments section below or on Facebook and Twitter.